. Yamata no orochi 山田の大蛇 huge monster serpent . 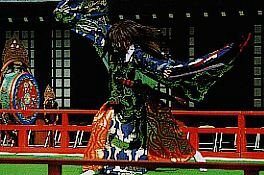 Kagura Dance and Music are part of the Shinto Rituals for the Gods, relating to ancient legends and were performed by priests and shrine maidens. Now in some rural areas it is counted as a form of local art (minzoku geinoo) and preformed by the villagers themselves during the annual shrine festival. Some are are more like festive folk-drama. The area of Chichibu is especially known for its local kagura. Some performances last more than one day. 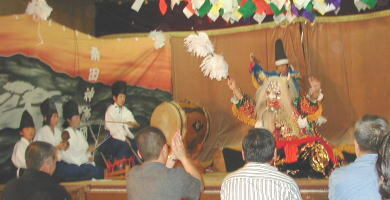 Even children perform in local kagura performances (kodomo kagura 子供神楽). Masks made from Japanese paper (washi) are used and most old costumes are very precious. There are various kagura types throughout Japan, see below. 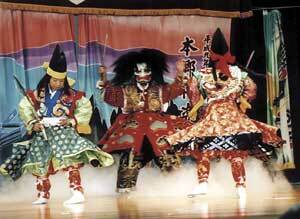 The Mikagura 御神楽 style of Shinto is also known as kagura and is very similar to the court music of gagaku. The original dance was performed by the goddess Ama no Uzume no Mikoto to entice out the sun goddess into the world. With time, Buddhist song-texts were introduced and the hichiriki, kagurabue, wagon and the shakubyoshi all came to be the instruments routinely used to accompany the songs. Only fifteen songs out of the repertoire are now performed and generally last about seven hours. The present performance tradition dates from the Meiji times. The all male singers are divided into two groups; the motokata and the suekata, each with its own set of songs and a principal singer who accompanies himself on the shakubyoshi until the other singers and instruments enter at a point known as tsukedokoro. The song texts include some of the oldest known Japanese poetry. The style is in general slow and solemn with the voice pure and unembellished. The notation is a system of neumes known as hakase, modelled on the notation for Buddhist chant, dating from the 12th century. The sumifu system has been in use since Meiji. The Satokagura 里神楽 style of Shinto is distinct from the court kagura and instead features older ritual styles similar to that performed at Shinto shrines. This style of music involves the preparation of a shinza or place of worship to which the gods are invited. A priestess or miko is central to the ritual which is generally performed on winter evenings. Satokagura can be subdivided into groups. One of the groups, Izumo kagura　出雲神楽, occurs throughout Japan, especially in the West and its main features are a series of dances performed with torimono (various ritual objects held by the dancers), followed by a noh play. Another group, Ise kagura　伊勢神楽　is found in Kyoto and in the North and involves a ceromony known as yutate in which warm or boiling water is sprinkled about. Edo kagura　江戸神楽　is found in Eastern Japan, especially Tokyo and is similar to Izumo kagura but is also influenced by mibu kyogen (a type of Buddhist morality play). 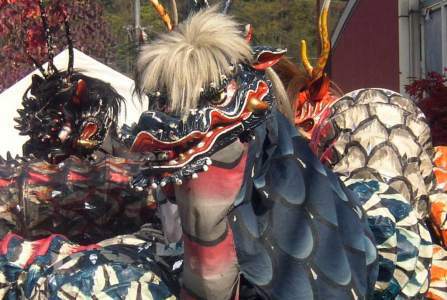 Other sub-groups include the Shishikagura 獅子神楽　which includes a lion dance (shishi-mai) and is now found in many forms throughout Japan and Yamabushi kagura　山伏神楽　which was originally performed by mountain ascetics. It embodies the eclectic, folk religious worldview of the Shugendo tradition. With time, Satokagura took on a more theatrical form when special dance-halls were built especially for this style known as kaguradono. Accompanying instruments are generally found to be stick drums and transverse flutes. The rhythms are strong and lively. As a result of the evil deeds of her brother Susano-wo, the sun-goddess Amaterasu-omikami hid herself in the Cave of Heaven. Susano, having been chased from Heaven, wandered across the continent of China until he crossed into the land of Izumo (modern Shimane prefecture) and came to the River Hi, where he met Princess Inada and an old couple wailing and lamenting. When Susano asked why they were so upset, he was told that every year the terrible eight-headed serpent Yamato-no-Orochi appeared, and that it had already devoured seven of their daughters and would soon come to take their remaining child, Princess Inada. Susano soon formulated a plan and made the Orochi drink some poisoned sake brewed from various nuts, and then killed it whilst it was drunk. He then recovered from the monster’s tail a sword that he named Ame-no-murakumo-no-tsurugi (Treasure Sword of Heaven) and presented it to his sister Amaterasu. He then married Princess Inada. a traditional dance in honour of the gods, performed by the maidens and priestesses (miko) of a shrine. Also called Miko Dance (miko mai 巫女舞). 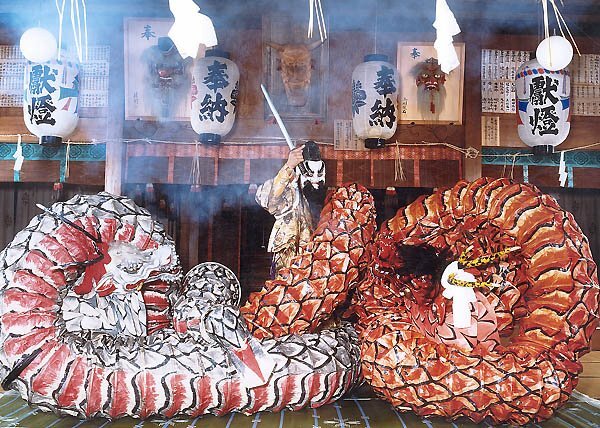 Orochi is a giant serpent which threatenes the local population. Yamata no Orochi （八岐大蛇、八俣遠呂智、八俣遠呂知　ー　ヤマタノオロチ), a Serpent with eight heads is killed by the Deity Susa-no-O (Susano)、as we have seen in Iwami Kagura.
. Yamata no Orochi 八岐の大蛇 Serpent with eight heads . The kagura style of dance and music is performed in the course of worshiping Shinto gods and this type of performance is best represented by the Matsumae kagura. It is believe to have been performed first in 1674 at Matsumae castle, formerly Fukuyama, being officially appointed to Lord Norihiro, the 6th head of the Matsumae clan. Kagura of this style is performed mainly at shrines in the south of Hokkaido. The fact that the Matsumae Kagura is traditionally performed and transmitted by the Shinto priests alone has contributed to the refinement of its artistry. Among the kagura dances performed by ordinary people is the Sanjo Kagura which is a variation of the kagura from Hachimangu Shrine in Sanjo city in Niigata prefecture. Also known as Dai Dai kagura, this particular style of performance was adopted by the Hokkaido Shrine, the Sumiyoshi Shrine in Otaru, the Muroran Hachiman Shrine, the Nopporo Shrine and the Takikawa Shrine among others, though kagura is no longer performed at the Takikawa Shrine. Kagura of this sort was developed after the settlers who came from the Sanjo area invited performers of ancient court music from their town of origin to dedicate their performance to the shrine. The Dai Dai kagura is performed by ordinary people of the community unlike the Matsumae Kagura which is performed by priests. Dai Kagura is a remnant of the activities of Shinto dance troupes in the Edo Period, who brought Kagura (God-Music) performances to the local people who could not worship at Ise Shrine. The troupes who traveled around Western Japan throughout the year gathered on annually on the afternoon of December 24 at the Masuda Shrine of the main actor to perform all their acts as offerings. 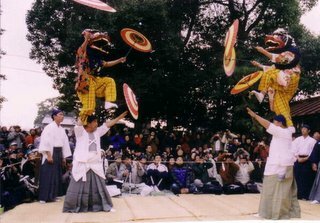 Contemporary minzoku geinô (minzoku geinoo, folk performing arts) in Japanese society is associated with the matsuri, or festival. Community members, such as workers and students, practise and perform various types of minzoku geinô in preparation for local festivals. However, a look at the history of minzoku geinô reveals that originally its practitioners were marginalized members of society, who used ecstatic expression to perform various rites such as healings, exorcisms, and blessings. Furthermore, the attitude toward ritual specialists was often negative; indeed, shamanistic practices were prohibited during the Meiji period (1868-1912). In response to social attitudes, ecstatic performers of Japan's premodern period negotiated their expressive powers in a variety of ways in order to survive. This paper introduces the reader to the typology of minzoku geinô that involves ecstatic performance presented by yamabushi, male mountain-dwelling ascetics, and miko, female shamans generally associated with Shinto shrines. Moreover, the discussion in this paper illustrates how ecstatic performance changed throughout history to the extent that it is now seldom performed by marginalized ritual specialists. Performers of contemporary minzoku geinô are accepted members of society. Furthermore, both the performers and the audience of minzoku geinô are affected by the transformative nature of ecstatic expression.
. Kagura at Kirishima Shrine 霧島神宮 . KAGURA as a kigo for haiku ! Thank you Gabi! You have helped me identify the Shiraishi Island kagura as the Iwami style. It certainly is a beautiful performance to watch. Thank you for a wonderful introduction to Kagura nationwide. You might be interested to know that I've recently published a book on Izumo Kagura based on my experiences over four years with troupes in Hiroshima and Shimane. "An Invitation to Kagura: Hidden Gem of the Traditional Japanese Performing Arts" is available at most online bookstores. and asks for human sacrifices. Sometimes a kappa in the form of a snake is seen as the "Master of the Pond" too. Der Herr des Teiches . Today’s yokai is really fun because not only is it imposing and awesome, but it is one of the rare creatures with a longer legend behind it, instead of simply a few sentences in one of Toriyama Sekien’s books. But first, an interesting question: what exactly is a yokai? It’s a strange question, because how do we really classify made-up creatures? Where is the line between yokai and yurei, or yokai and kaiju, or even yokai and monster? And even though it seems strange to pick nits over imaginary creatures, it is something that we have been doing for a long time—at least as long as we have been classifying real creatures! Even back when Toriyama Sekien was writing his books, he was developing something like a Linnaean taxonomy for them. Generally, if you ask any number of yokai-ologists (is that a thing??) to define a yokai, you will get as many definitions as you have people. Most of the time, the similarities are just too vague to truly iron out. One story might seem to draw a clear distinction between certain characteristics of a particular yokai, but then another story might blow those distinctions to pieces. For example, some people might argue that a kirin is a kami, not a yokai… but then in some places, kappa and hyosube (to name a few) are worshiped as kami and even have their own shrines. Does that mean kappa are kami as well? Many ghosts are also worshiped as kami, such as the famous Tenjin-sama, who is the god-version of the yurei Sugawara no Michizane. So is he not a yurei? Some might say that yurei are the spirits of people, but then are onibi ghosts or yokai or something else? The vagaries are endless, and it becomes impossible to pin down a truly authoritative definition. And then, of course there are the similar terms bakemono, mamono, mononoke, and so on… where does it end? In the Kamitsuno and Shimotsuno settlements in Soeda Machi, the "Tsuno Kagura" is dedicated for the Jinko-sai (Jinko festival) held by Takagi Shrine at the beginning of May every year. In Issa's time a form of sacred dancing called kagura (possibly meaning "divine storehouse") was commonly performed, mainly by female shamans. Kagurazaka - Kagurasaka 神楽坂 "Slope of the Music of the Gods"
is the local word in Akita and Yamagata for 山伏神楽 the Kagura dance of the Yamabushi mountain priests.